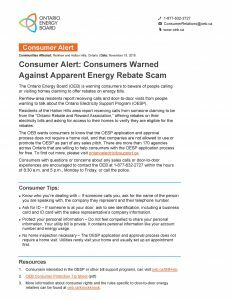 Renfrew-area residents report receiving calls and door-to-door visits from people wanting to talk about the Ontario Electricity Support Program (OESP). The OEB wants consumers to know that the OESP application and approval process does not require a home visit, and that companies are not allowed to use or promote the OESP as part of any sales pitch. There are more than 170 agencies across Ontario that are willing to help consumers with the OESP application process for free. To find out more, please visit ontarioelectricitysupport.ca. Consumers interested in the OESP or other bill support programs, can visit oeb.ca/BillHelp. More information about consumer rights and the rules specific to door-to-door energy retailers can be found at oeb.ca/knockknock. Please visit http://www.oeb.ca/industry for more information.